MILAN – The 4th edition of the Coffee & Tea Festival will feature many exciting additions and a variety of activities and highlights, guaranteed to benefit all exhibitors and visitors alike. The event is to take place at the Meydan Grandstand and Convention Centre (home of the Dubai World Cup) between 30th October and 2nd November 2012. The International Coffee & Tea Festival successfully integrates all aspects of coffee and tea under one roof and features the best equipment, services and products from regional and international producers and suppliers. The event delivers the world’s most progressive industry-related products and services to the region and provides exhibitors the exposure they need to generate qualified leads and develop long-term business relationships. focus on Coffee & Tea and Specialty foods. Check out some of your favourite cafes as they wow you with some of their new products; get exclusive access to the concept cafes and brands that are yet to set up in the UAE; indulge at the many outlets offering a wide variety of delicacies from chocolates to pastries and pizzas. If that’s not enough – step it up a notch at the co-located International Fine Food Festival. 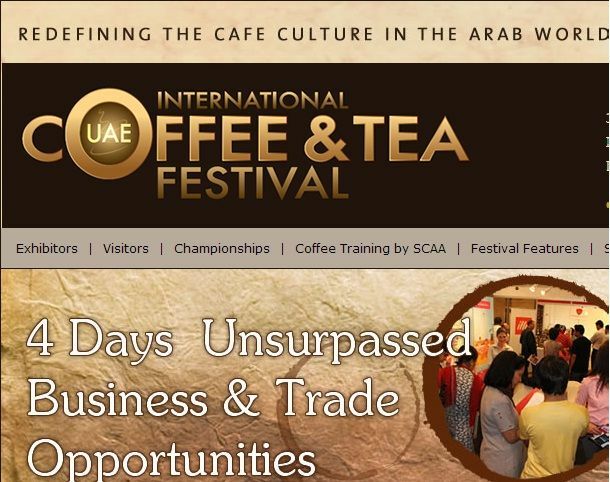 The International Coffee & Tea Festival incorporates a dedicated zone for retail businesses. at home or at a café. Designed for businesses looking to engage, sell and educate consumers on various brands and the availability of coffee and tea and all its complementary products. Business Development and Demonstration Theater This is an exciting, back-to-back programme of live interactive product/brand and company demonstrations, workshops and constructive seminars throughout the Festival. The ‘Grow Your Business’ programme also includes educational and tutorial workshops on tea blending, coffee bean sourcing, selection and storage, coffee tasting and palate development, steps to opening a café, design tips for café owners and many more. 4th National UAE Barista Championship (UAEBC) UAE Barista ChampionshipThe biggest event of the region’s espresso industry is returning to Dubai. It is time for submission of entries to the 4th UAE BARISTA CHAMPIONSHIP. The most skilled and professional baristas in the UAE will again battle for the coveted title of the 4th UAE Barista Champion at the International Coffee & Tea Festival 2012. The competition begins on 30th October and concludes with a final round and champion’s ceremony on 2nd November. The UAE Barista Championship will highlight the skills and knowledge of the country’s finest baristas. Each barista must prepare four espressos, four cappuccinos, and four original espresso-based signature beverages in a 15-minute performance set to the music of their choice. As they ready their coffee beverages, contestants engage the audience, explaining their actions and selections, while expertly working on the espresso machine. The winner of the 2012 UAE Barista Championship will receive the highest national honour for a Barista and a paid trip to represent the UAE at the 2013 World Barista Championship. Each year the bar gets set higher and higher as we see competitors who have trained and practiced meticulously to get to the World Barista Championship. Competitors go through the process of planning every aspect of their presentation. They pick the coffee they want to serve, the cups, the table decor and even the music to set the ambiance for their performance. 1st UAE Latte Art Championship (UAELAC) UAE Latte Art Championship A new championship will be introduced to the UAE’s Coffee industry – the 1st National UAE Latte Art Championship as licensed and sanctioned by World Coffee Events Creative and professional Baristas from across the UAE will converge for the first time and battle for the inaugural coveted title of the 1st National UAE Latte Art Champion at the International Coffee & Tea Festival 2012. The competition begins on 1st November and concludes with a final round and champion’s ceremony on 2nd November 2012. The UAE Latte Art Championship highlights artistic expressions in a competition platform that challenges the barista in an on-demand performance. In this championship the baristas present two identical samples of “art in a cup” for 3 different beverages; a latte, a macchiato and a signature beverage. The first two pairs are prepared using only a pitcher of milk. The signature beverage can be made with any surface aid as chosen by the barista. To ensure that the presented art is what the barista was meant to deliver, the judges will be given a picture of the intended design prior to the start of the presentation. The beverages will be judged immediately for its visual attributes, creativity, identical patterns in the pairs, contrast in the patterns, and the baristas overall performance. Scores are openly shared as the competition unfolds. The top 6 competitors go to the final round where one winner will be declaredthe UAE Latte Art Champion. Only one competitor from each country with a sanctioned competition can enter the World Latte Art Championship. The winner of the 2012 UAE Latte Art Championship will receive the highest national honour for a Barista and a paid trip to represent UAE at the 2013 World Latte Art Championship. Coffee Training by SCAA Enroll in exceptional coffee training from industry leaders without a large financial commitment or the need to travel abroad. Skill Building Workshops, certified by the Specialty Coffee Association of America (SCAA) is coming again to the Middle East. Espresso + Brew Bar A section dedicated to the preparation, products and the tastes of coffee. Dedicated to Coffee products, equipment and accessories; The World’s best Coffee brewer of 2012, Matt Perger will be joining us from Australia to oversee operations at the Espresso & Brew Bar ensuring all coffee is prepared using the most appropriate method of preparation. Highlight the unique tastes behind each bean by using a variety of brewing methods from Espresso machines to pour-overs and stove tops to Aeropress… Reserve sessions here to feature your brands at the Espresso & Brew Bar. TasteTEA Zone The place where Tea is the centre of attention; educate and excite the audience with your brand, new product and sample your latest blends of tea. This is a great platform to showcase your knowledge of teas and new ways of preparing and serving tea. The ideal platform for all tea growers, producers, exporters, blenders and distributors to get involved; entertain a dedicated tea audience and gain valuable face time with validated buyers.